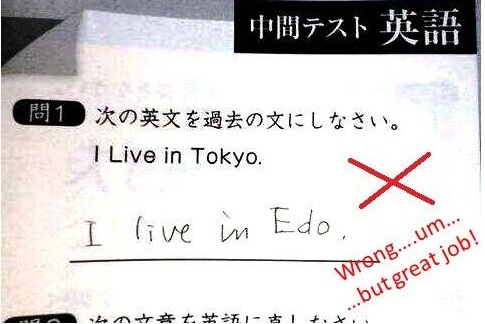 “Write this sentence in the past” (credit: 本気の発想 translated poorly by Craig as “serious creativity” from Twitter user tag: @Honki_Honki. Teachers are told to make learning fun. Yeah! However, there is a fair percentage of learning that includes rejection and supporting that online is hard. Educational psychologists manage to gloss over the emotional side of things and come up with statements in research jargon that a learner is adjusting mental schema according to new information. Adjusting one’s mental schema to accommodate a big whopping REWRITE on a paper may have positive correlations on psychometric evaluations of learning, but calling it fun is a stretch. Many teacher training programs and educational psychology texts make it seem as if the learner simply processes information, without any pain. But adjusting one’s own “schema of the world” includes a key realization, I was wrong the first time. Confronting one’s own being wrong is decidedly not fun, but it is effective. Sometimes it is so effective that we remember the lessons for a lifetime. Here are few of mine: Mr Savery, my highschool German teacher who I admired, told me to guess on the German language article declensions on my advanced placement exam. “Look, declensions in German are ‘en’ 70% of the time, if you try and figure it out, which is what you generally try to do and I know this because I have watched you take my tests for 4 years, you’ll lose time you could have spend getting to the questions that you are better at answering. Just guess all your declension items and move to vocabulary items as fast as you can.” This made me rethink just how much I knew and strategize my learning down the road. I went on to survive a year in Austria with this knowledge and pass a year’s worth of coursework delivered entirely in German. Dr George Hole’s comment on a final paper, “you didn’t think as much on this paper” was devastating. This forced me to rethink my writing and shortly thereafter I won a scholarship to Columbia University based on my application essay. Dr Carol Numrich’s similar comments on graduate papers were the same. Her feedback played into how I approached my doctoral application where I secured a fellowship to Indiana University. Ginette Delandshere handed me down a whopping REWRITE. Susan Herring’s 300+ requests for revision on the post-defense edit of my dissertation spun my head. How could I possibly write that poorly? Elizabeth Boling’s comment to my doctoral quals was eye-opening, in a more holistic way than just school, “righteous indignation does not serve you well in this context.” This idea played into my search strategy on the job market and helped me survive my dissertation. None of these rejections were fun, but they were all effective. All were in school, and none were online. Healthy failures, as opposed to failures that lack transformative impact, also share something in common that is hard to accomplish online: care. The memory of the failure is coupled with the memory of the person who delivered it. It is the failures that are handed down from specific people that we remember. The failures I remember were all handed down from people who cared, or at least I felt that they cared for me. Imparting that feeling of being cared for is part of being a professional educator. While a missed objective question on an impersonal test may just require one to revisit the chapter, failures associated with more transformative learning all revolved around larger efforts: writing longer papers, preparing for bigger tests that seemingly predict a future, or attaining a significant life changing milestone–like finishing the Phd and getting my first tenure track job. Multiple choice, short answer and like approaches to formative assessments do not offer access to this kind of learning. Occasionally I have seen phrases on job descriptions in order of “genuine care for students,” but I have yet to see that operationalized into required teaching practices, especially online teaching practices. Failures on the big things may need to come from someone who has, or seems to have, a general interest in your well being in order to make that change from simple procedural and concept learning to transformational learning. The online instructor is not equipped with the same tools to express this care, and generally has had few examples to fall back on. A large percentage of our online teachers have not experienced how care is expressed or attained online and have few experiences themselves of how failure is supported online, myself included. The online courses I have taken have all seemed somewhat removed from me; a kind of no frills instructional endeavor that gets right to the point, stays there, and ends. Read the materials, watch the video, listen to the podcast, post twice or three times a week, take the test, submit via the dropbox, finished. There were few pats on the back and little encouragement. Given this context, there was little opportunity for the instructors of these courses to impact real transformative change in my being. Any instructor who attempts incorporating support for failure is breaking new ground because, not only did they not experience failure support themselves, the media which they are working likely did not even exist a few years ago. Online instructors are not only learning to teach online, they are learning a whole gamut of digital ways to communicate. The best they can hope to do is try out some tips they saw at a conference, and learn from their mistakes over a long period of time, which I am trying to do. Given the significance of these experiences in the longer term perspective of the experience of learning, I find it remarkable that I don’t find more emphasis on teaching failure well. Andrew Tawfik is starting to scratch the surface here, but we have a long way to go. In many years of teacher training I don’t remember ever focusing on how to deliver and support failure in learning, and I don’t remember any of these experiences that happened at-a-distance. Now that I am teaching online via an LMS, I feel even more handicapped at delivering this kind of caring for failure via the machine. Perhaps this is the greater implication of Joni Dunlap and Patrick Lowenthal’s advocacy for high touch low tech in online learning. But this is far easier said than done in contexts where learners have little time for synchronous communication and all their experiences come filtered through the lean media of a learning management system. Healthy failure is difficult to administrate. It is a tricky business to put requirements for failure into programs, course designs, or teaching requirements. In the dynamics of instructional roles among teachers, few instructors enjoy being the one who tells learners that they were flat out wrong, the paper failed to meet certain standards, the learner is unlikely to pass given the present course of action, and so on. In graduate education there is a second ethical responsibility of telling a learner that, while the student may pass the course, from the state of the learners’ progress, it appears unlikely that the course of study will prove a prudent use of the student’s time, energy and money. This may just be the dirty work of teaching, especially online teaching where the message comes stripped of all tone and affection expressing care. Every job has some dirty work. Handing out the required rewrite may just be the dirty work of online education. Including precautionary statements in the omnipresent, all powerful, contractual agreement syllabus, seems to have little effect in mitigating the emotional impact. The statement “If the required criteria are not met in your final paper you may get a rewrite” is little consolation to the learner who actually does get a rewrite. Explanations that the editing process includes some of the most important aspects of learning the course entails can add salt to the wound even though the intension of the statement is to express care. In our effort to make learning fun we sometimes handicap teachers, and learners, into thinking it is supposed to be fun all the time. If our most effective teaching strategies include experiences that are not fun, we may be handicapping our teachers from using the best tools they have to teach, especially online. By craig d howard in teaching on October 12, 2014 .